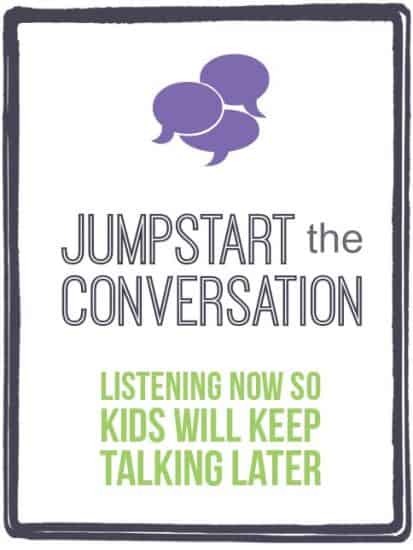 Jumpstart the Conversation is an Ebook and Email set (1 email a week for 4 weeks) that will help you begin to practice the skills for building a close family through conversation. Through our own trail and error, as busy moms of many kids, we have found ways to open the door to meaningful conversations that help us really get to know our kids and begin teaching them the art of conversation – a skill that will serve them for life. PLUS – Conversation Games Play Book – this 8 page download gives you 15 FUN conversation games to play with kids as well as tips on how to include younger kids and older siblings. Once you purchase Jumpstart the Conversation you’ll automatically receive the email set as well. 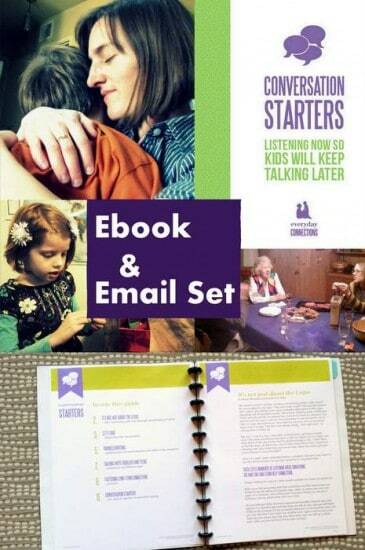 These emails will comes out once a week for four weeks and guide you through quick, easy to implement activities that will help build the habit of authentic family conversations. It’s like getting weekly nudge to keep this habit going. Extra – PRINTABLE CONVERSATION STARTER QUESTIONS! Conversation Starters also includes a multi-page printable download of fun conversation topics to engage your family in conversation. Some of the questions are designed specifically to help you and your child connect again after you’ve been apart for the day, many will get everyone using their imaginations and chatting. Ready to build a family habit that will lead to strong and connected relationships for life? Buy your copy today!